Of adventure, disgrace & feats of glory. 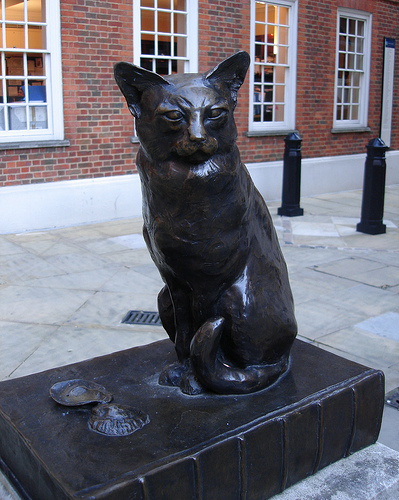 And Hodge the Cat was also here! 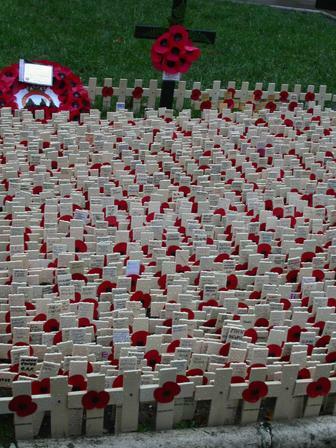 In a tea shop on Fleet Street, Edward Honey (an Australian reporter) came up with the idea of 2-Minute Silence on Armistice Day. He wrote about it in a local publication and the South African government were the first government to put the Silence into operation. King George V was so inspired that he introduced it in Britain soon afterwards. It cost goldsmith Richard Hoare £420 (£37,000 in today’s money) to buy his new bank in Fleet Street, which he had founded in 1672 under the sign of the Golden Bottle in Cheapside. He moved the business to number 37 Fleet Street, where it still stands today. His bank was so prosperous that he was knighted by Queen Anne and Sir Richard later became Lord Mayor of London in 1712. Hoare’s Bank has the oldest purpose built banking hall in Britain. During the Jacobite Rebellion, Richard Hoare mobilises the local guard to defend London from Bonnie Prince Charlie, if he were to reach the City. In 1798 and 1810, some of the first recorded excavations of Stonehenge were done by Richard Colt Hoare and his archeology companion William Cunnington. Due to the bank’s location, temporary balconies were erected for the staff and customers to watch Queen Victoria’s Diamond Jubilee procession. Customer ledgers were hand-written until 1962. Lord Byron (poet) and Jane Austen (author) were customers of the bank. For five generations the Hoare family held controlling shares in the Red Lion Brewery, one of London’s oldest, which was well-known for brewing stout and sparkling ales. The brother of the bank’s architect was responsible for bronze gates at Marble Arch and a balustrade for Buckingham Palace’s Grand Staircase. In 1664 the trendy bank received diarist John Evelyn, who later wrote that he had seen “fans like those our ladies use, but much larger, and with long handles” at the bank. And in the new millennium, the bank commissioned commemorative and collectors’ umbrellas. Apparently a partner or member of the family has to stay in the bank overnight. 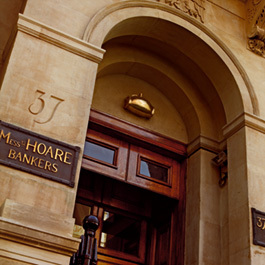 Today the bank is run by the 10th and 11th generation of the Hoare family. In the 19th century, the bankers were instructed to carry out ‘no business outside the bank except in top hats’. Today Hoare’s Bank has three West End branches, employs 350 staff and has a balance sheet of almost £2billion….a pretty good return on the £420 spent on the premises over 300 years ago.